The City Daily Photo Community theme for March is cafe chairs. 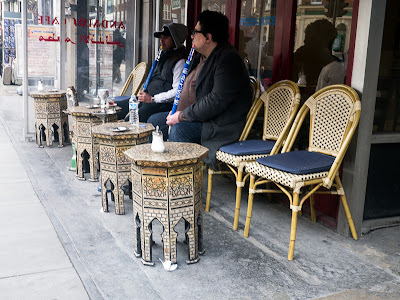 If you take a stroll down Edgeware Road you will find lots of cafes like this one with a row of seating and customers smoking shisha, a pleasant smelling flavoured tobacco. Take a look at cafe chairs around the world. On another note; there is a problem with the way that posts are viewed in explorer. I believe this is to do with the way that blogger now imports photos. Viewing is fine in firefox and chrome. Has anyone found a resolution to this conflict? European cafe chairs always look so much more attractive than those in other countries! Viewing is fine in Explorer. You found some really interesting cafe chairs. I haven't seen any problems in explorer but I only use explorer at work. I'm using Safari at home. You found lovely chairs! I gave up using Explorer ages ago, just use Chrome, though I do notice blog glitches from time to time even with Chrome. I've stopped using IE for Blogger too so I can't help. Though there are some exotic cafés like this one in Paris, I couldn't find one in Versailles... Cool shot! I'm still using IE; Chrome was terribly unstable for me. I haven't had problems with your site. This looks like a pleasant spot. Do they also serve tiny cups of sweet peppermint tea? This is a pretty interesting cafe shot, Mo. I have been using Safari most of the time and don't have trouble seeing your posts. Interesting cafe. I can't wait to see London for myself this summer! I gave up on Explorer and use Firefox now. Recuerdo estos lugares entrañables...estupenda fotografía, felicidades!!! I haven't noticed any problems on your site, Mo. working just fine for me!! I love this area of London, it reminds me of all the little Turkish and Greek cafes and coffee shops in Johannesburg where my relatives used to hang out.